This guide reviews the websites of the top ten medical companies from the point of view of a physician or other health care professional. The reviews determine the effectiveness of a top website in terms of its design, usefulness, readability, and ease of navigation. A medical website is selected as a top website if it has significant useful data that is up-to-date and is not too commercially oriented. It needs to be clutter free and provide legitimate and reliable information. In the conclusion section at the end of this guide, there are the best and worst websites chosen from these top ten. These websites are produced by ten of the most influential and powerful global medical companies, health care plan organizations, and pharmaceutical companies. Therefore, they contain much information about the companies and the products that they produce and /or the services that they sell. To be considered one of the best websites, each medical website also needs to provide accurate information that is useful for health care professionals as well as for the public. The best websites in this category are designed to be used by all the stakeholders in the health care industry and provide a lot of useful information that is easily accessible. Much of the information on this website is about the McKesson Corporation. The company works with pharmaceutical businesses and pharmacy systems. McKesson also manufactures products for the medical/surgical sector and life sciences. The company offers practice support and solutions for specialty medical practices that include oncology, rheumatology, gastroenterology, ophthalmology, and neurology. To find useful information, health care professionals can read the blog and find articles about professional issues that are published a few times each week. Another information section of this website provides biopharma resources for companies wanting to bring specialty therapies to the market. 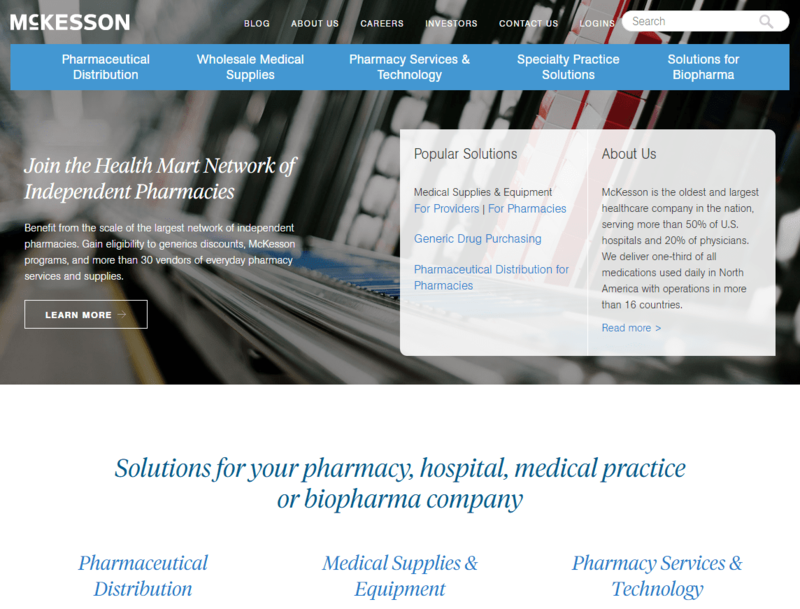 This area of the website offers white papers and brochures on McKesson’s solutions for the medical, surgical, and pharmacy sectors. UnitedHealth Group has two subsidiaries that it provides links to on this website. They are Optum, which is a technology services provider that specializes in data and analytics for health care management and pharmacy care. Optum has solutions for government agencies, businesses, and individuals. The other subsidiary is UnitedHealthcare, which provides health benefits programs as group coverage for employers and for individuals and families. This website has a serious design flaw. 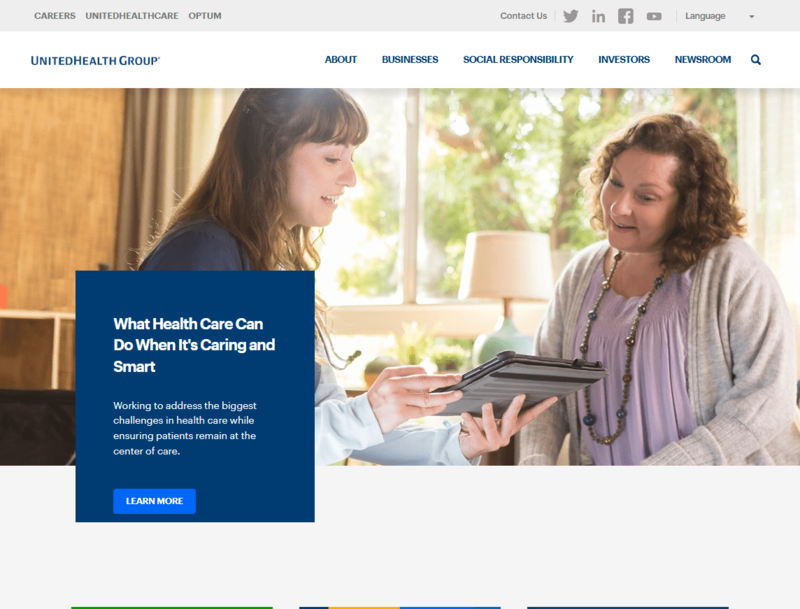 It assumes the website visitor will know that there are two subsidiaries of UnitedHealth Group (Optum and UnitedHealthcare) and will click on the link of “businesses” to learn more about them. This is a poor navigation design. To solve this problem. the website should use a separate description of what is offered by the Optum and UnitedHealthcare subsidiaries. For example, it could use the words “services for health care providers” to link to the Optum information and “health benefits plans” to link to UnitedHealthcare information. These descriptive phrases are more informative navigation links instead of using the generic word of businesses. There is also room for improvement in the content. There is very little general health care industry information on this website that is useful because it is so biased toward the company’s interests and all the “news” is only related to the companies. 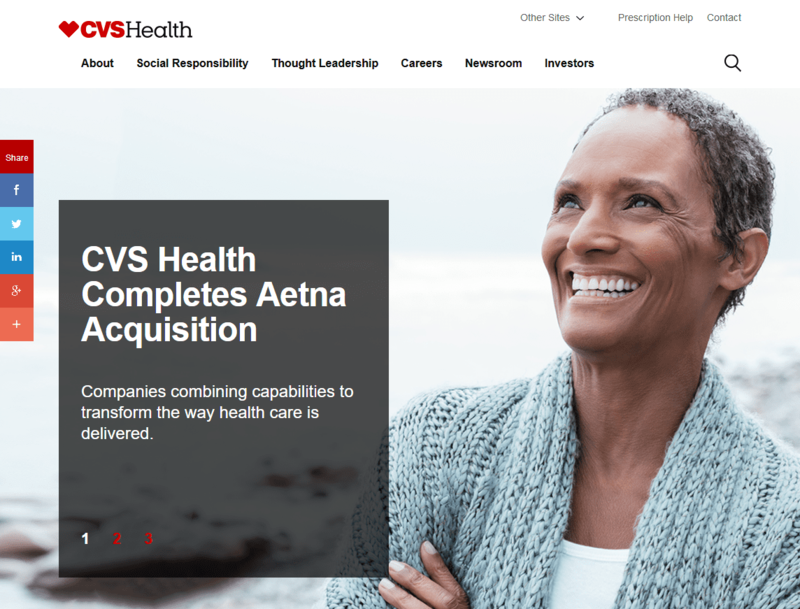 This is the main website for the CVS company, which recently acquired the Aetna insurance company that has a website review in this guide also. The CVS website has links to other subsidiary companies’ websites that include CVS Pharmacy, CVS Caremark, CVS MinuteClinic, CVS Specialty, and CVS Payor Solutions. These links are listed in a dropdown menu called “other sites” on top of the home page. If it is important enough to have these links on the home page, then they should be given more prominence than being hidden in a dropdown menu. It would be better to list them all out as text links in the header of the home page and not list them on a menu. There is an interesting CVS web-based tool on the site that shows the state-by-state impact of the CVS locations and CVS services offered in America. This function is good but there is an interface design flaw. A button marked “create report” is located at the top left of the web page. It causes the creation of a report in the pdf format. However, to use the feature properly, a visitor must first select the state that they want the report about. The selection is made from a dropdown menu that is below this button on the web page and then to get the report they must go back up to use the “create report” button. For a more intuitive design, this button should be below the state selection area. The CVS Pharmacy (cvs.com) subsidiary website attempts to block anyone outside of the United States from using it. If you happen to go on vacation outside the US or be stationed overseas on military assignment and want to access the website, the website blocks access. You will have to use a US-based virtual private network (VPN) to get around the annoying IP-address blocking. This idiotic blocking of non-US website visitors should be removed. It only irritates CVS customers, since any hacker can easily get around it. The CVS newsroom has some interesting articles about the health care industry along with press releases about the company. Of the medical websites reviewed in this guide, this one has the best intuitive navigation and useful design. The top menu choices on the header include about us, solutions, insights, and careers. These provide clear information and links to quickly get to the desired portion of the website easily. Offered under the dropdown menu for the solutions link are health systems, pharmacies, physician practices, manufacturers, and animal health, which are easy categories to understand. 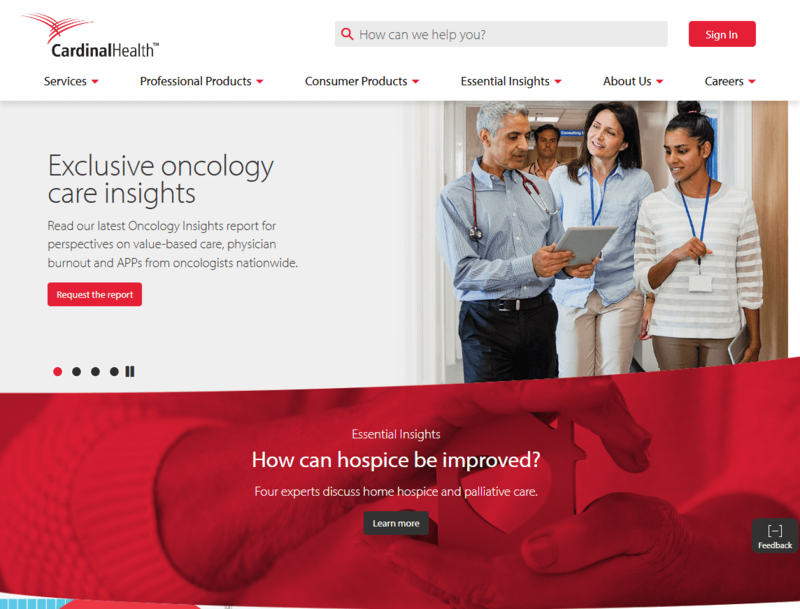 Under the insights dropdown menu, there is an explore topics choice that leads to a vast library of content on many topics/ Topics included are advertising, analytics, buying a pharmacy, cell and gene therapy, clinical trials, pharmaceutical distribution, marketing, legislation, inventory management, patient care, and patient support services. There is also information about practice management, specialty pharmacy operations, secure supply chains, technology, and much more. This content library is very extensive and searchable. It is useful information for many health care practitioners and especially helpful for those involved in pharmacy operations. This website breaks down the information into categories of services, professional products, and consumer products. The consumer products section has a tool to help a person find a retail store that carries the Cardinal Health products for sale. There is also an essential insights section of quality content to read. There is the ability to use a dropdown menu and select a filter of the content to display articles that are of more interest to a web visitor. These filters sort through the articles based on the type of viewer (called “audience”). The categories include acute, manufacturer, payer, physician office, and retail pharmacy. This website does an excellent job of inviting visitors to sign up for a company newsletter. There is a small but obvious “connect” button for email address entry. There is also an invitation to get the newsletter on the top of the essential insight web page. In addition to this feature, there is a plus sign on a button labeled feedback that allows a web visitor to give their opinion about the web site. The clever design of this website has features that are noticeable and useful without putting them in a way that blocks a user’s view or is annoying. 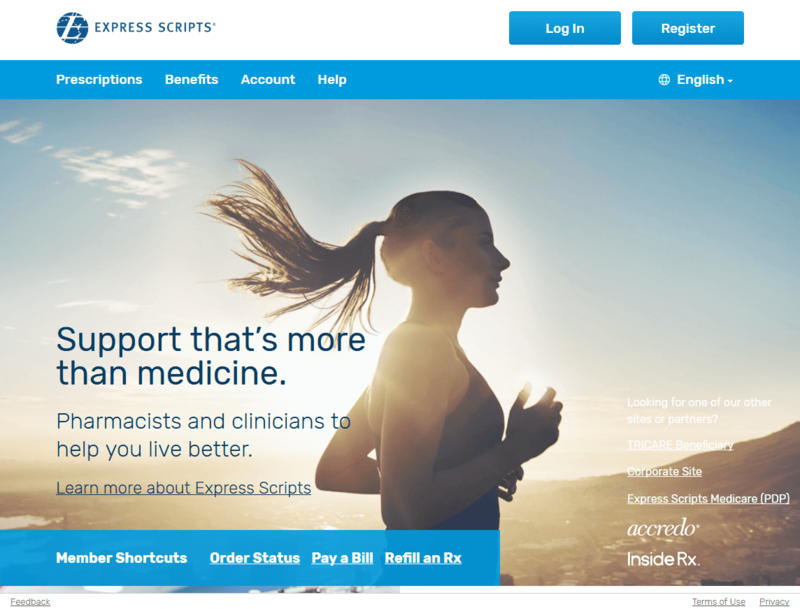 This website is for those who are members of the Express Scripts pharmaceutical benefits plans through their employer, health plan, or Medicare Part D insurance. The website allows members to set up delivery of prescription or for pickup at a local participating retail pharmacy. The website interface is simple and easy to use. Members can get information about the program, pay a bill, order or refill a prescription, and get help. The only information of general use for health care practitioners is the up-to-date news about pharmaceutical recalls. Anthem is the trade name of the Blue Cross/Blue Shield health insurance programs. This website is for members and providers of this health insurance. Anthem is available to some with federally-supported Medicare and Medicaid. 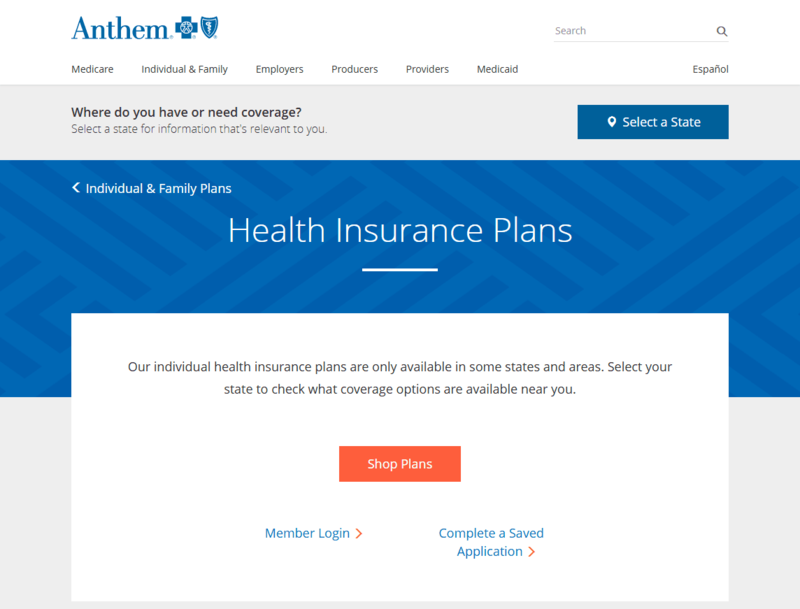 The Anthem health care plans are also available through some employers and as an individual or family policy. This website is extremely well designed. Website visitors can search for information by selecting a category on the home page that represents their interests. This leads to a subset of web pages that gives them opportunities to shop for different Anthem health care plans, gives plenty of information about the different programs, and offers help for those that need assistance. New members can enroll in their plan on this website and pay their bill online. Existing members can log in to review their account details. There is also a blog of information. The articles on the blog are about subjects related to preventative health care, member news, and basic health insurance questions. Kaiser Permanente is a large health maintenance organization (HMO) serving a total of over 12 million members in California, Colorado, Georgia, Hawaii, Oregon, Washington and the Maryland/Virginia/ Washington D.C. region. This website is designed for member use. It is well designed and the interface is intuitive and user-friendly. It is available in both the English and Spanish languages. It helps people shop the plans, sign up for membership services, find the care and the providers in the Kaiser system that they need, and manage their health. Kaiser is proactive in the health care management of its members. The website provides plenty of resources for members to learn more about improving their health. Online programs and information available through the website include prenatal care, diets for losing weight, and exercise routines. It is easy to scroll through the blog posts that appear at the bottom of the home page. In the Kaiser database, there are close to 5,000 high-quality articles on health care issues that are searchable on the website. There is no requirement to be a Kaiser member for anyone that wishes to read these articles. Aetna was recently acquired by CVS. It still maintains its own customer service website for its policyholders and members. It also has information on its website for employers, providers, and insurance brokers/agents. The website is available in English and Spanish. Individuals can request an insurance quote, sign up, and pay the bill online. Employers can review plan options, and get a quote. Once they contract for services, they can manage their plan online, get questions answered, and pay the bill. Health care providers can apply to join the network and, once accepted, get an online account to learn about the programs. Insurance brokers and agents that sell the Aetna insurance products can manage their sales account with many support tools offered on the website. One useful resource found on the website is the health guide. Members can select the categories of living healthy, understanding health care, and managing health. The health guide is a resource available to anyone who wants to read the articles. There is no requirement to be an Aetna policyholder or member to use this resource. Humana is a large health insurance plan company that has over 14 million insured as its customers. Its website is designed well to accommodate the needs of members. It helps individuals and businesses select plans and access member services. New members can register after they are enrolled in either an individual plan or become a member through their employer. Humana has links on this website to other websites that Humana created to support employers, providers, caregivers, and insurance agents and brokers that sell Humana policies. Humana has a Go365® wellness program for its members, which rewards them for doing things that create a healthier lifestyle. 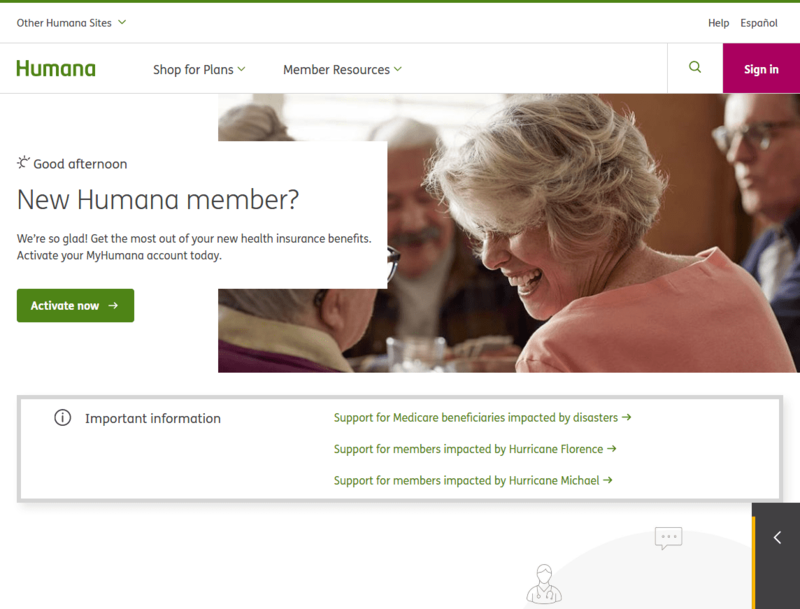 Except for a few articles that are shown on the home page, a person must be a member of Humana to be able to access any of the other information. The CVS and the UnitedHealth Group websites possibly have a few design flaws that should be corrected. 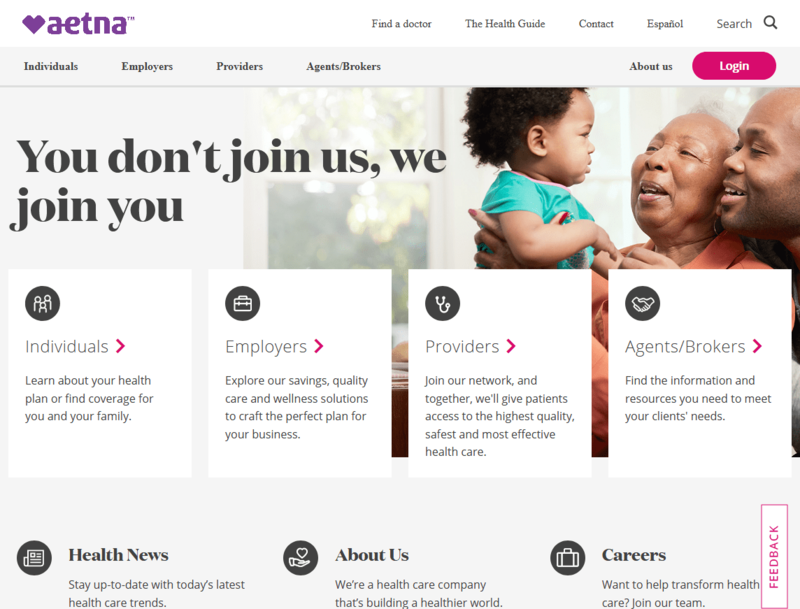 If Humana has more articles available for its members, it should make more of the information accessible on its public website to increase the website’s authority and improve its ranking on the search engines. 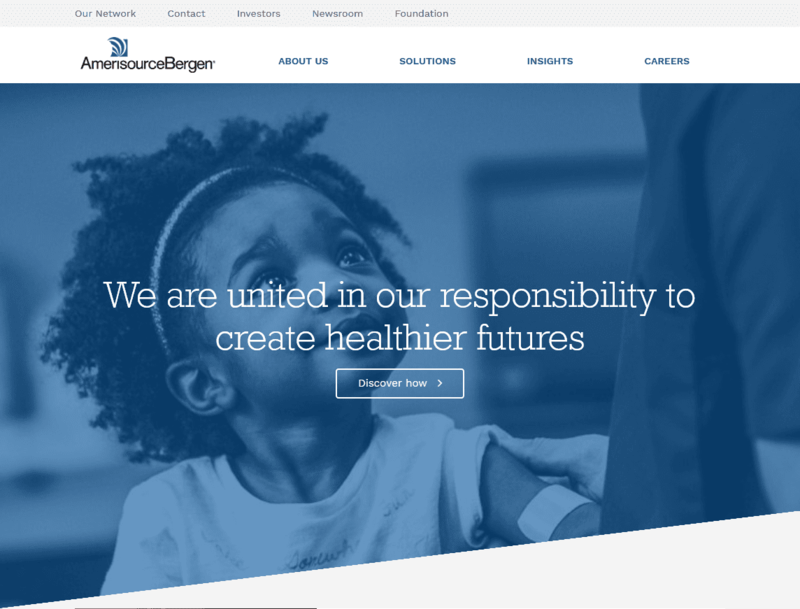 For those who want to browse articles by categories, the website of the AmerisourceBergen Corp. is an excellent resource. Aetna’s website is a close runner-up and comes in second place. Its website addresses the needs of all health care stakeholders who use Aetna’s products and services. 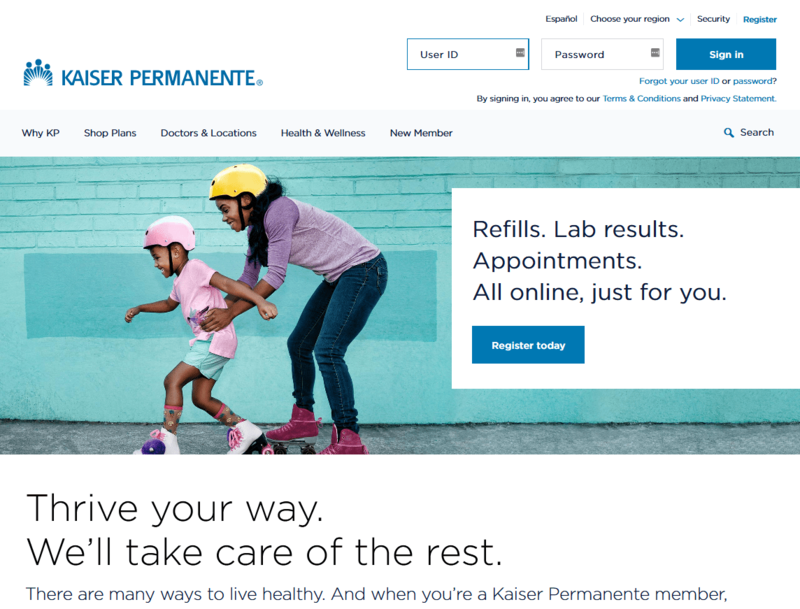 The best-designed website, of the ones reviewed in this guide, is the website for Kaiser Permanente. There is a huge database of Kaiser articles that anyone can read, which, along with its superb website design, is why it ranks the best.